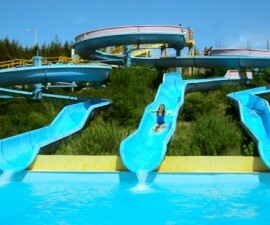 Norpark is one of Portugal´s leading water parks. It occupies a prime location north of Lisbon in Nazaré, right next to the Praia do Norte. It is easily accessible from the capital by road, situated as it is close to the A8 motorway and offers plenty of parking facilities. Rail links are also in place, South to Lisbon and North to Oporto. The park is set in an area of 42,500m2, of which 12,500m2 is laid to grass. Here guests can take a leisurely stroll, relax in the shade of the trees and enjoy the views across the park and out over the Atlantic Ocean. Families and friends visit Norpark throughout the summer season to enjoy its broad range of high-quality facilities. Changing facilities are clean and modern and lockers and towel rental service are available for a small fee. 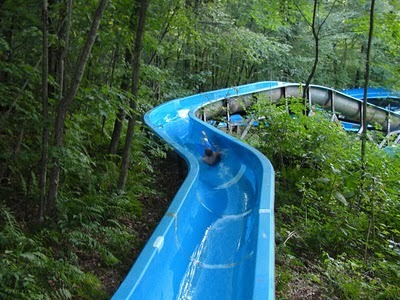 Once inside, the more daring can take the plunge down one of its 4 high-speed slides while little ones clamour for more after trying out the three dedicated children´s chutes. Further facilities for the younger generation include a dedicated children´s leisure pool. This area was especially designed with fun and safety in mind. Spanning an area of 272m2 the pool height varies between 0.15m, suitable for the smallest of people to paddle in, to 0.55m to provide adequate depth for a safe descent on the mini slide. 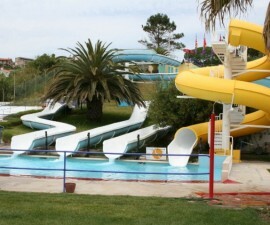 The children´s pool is monitored by lifeguards and security staff throughout opening hours to ensure their safe enjoyment. 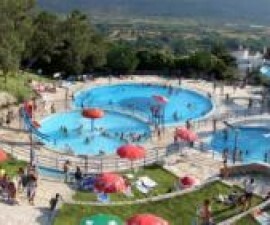 Fitness fans will enjoy swimming a few lengths of Norpark´s semi-olympic pool that is also available to visitors wishing to take a refreshing dip at any time of day – highly popular during those hot summer months. For the more indulgent the giant Jacuzzi beckons. Heated to a constant temperature of 30 degrees and with a capacity for 25 people, it really is the ultimate place of luxury and relaxation in which to while away your day. If all that relaxation leaves you yearning for more action, simply hop back on the water slides or join an aqua exercise class in the hydro pool. Classes are held daily and last for 50 minutes, and are led by qualified instructors who will provide all the necessary equipment. All that exercise will no doubt leave you feeling peckish. If so, help is at hand from the snack bar which offers a variety of refreshments to suit all tastes and budgets to complete your fun-packed day at Norpark.